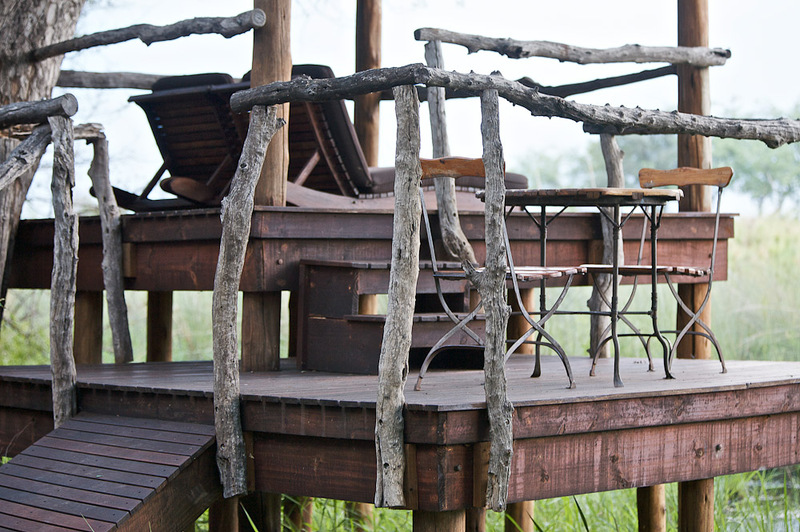 The outdoor pavilion at Jack's Camp, Botswana. The African safari. It’s one of those bucket list journeys you’ll tell your kids about. We uncover the best of the best at Jack’s Camp, &Beyond Xaranna and &Beyond Sandibe. 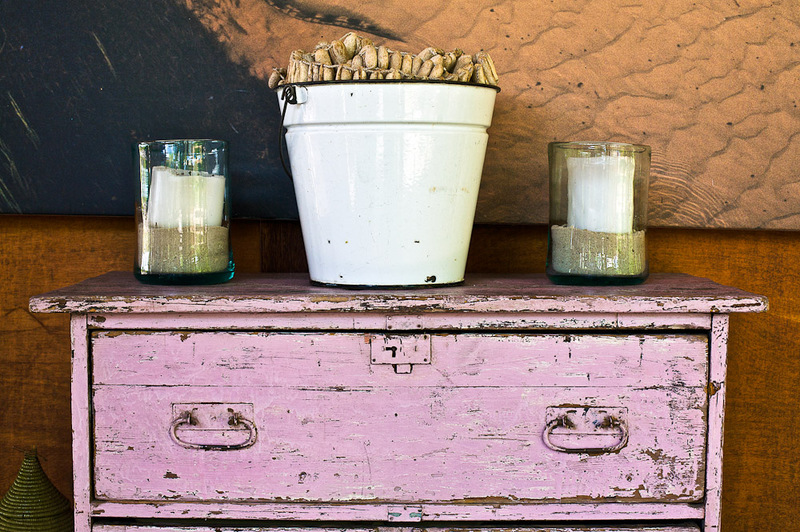 Words and photography by Elana Castle. Did you hear that?” Super asks. We stop to listen. Silence. 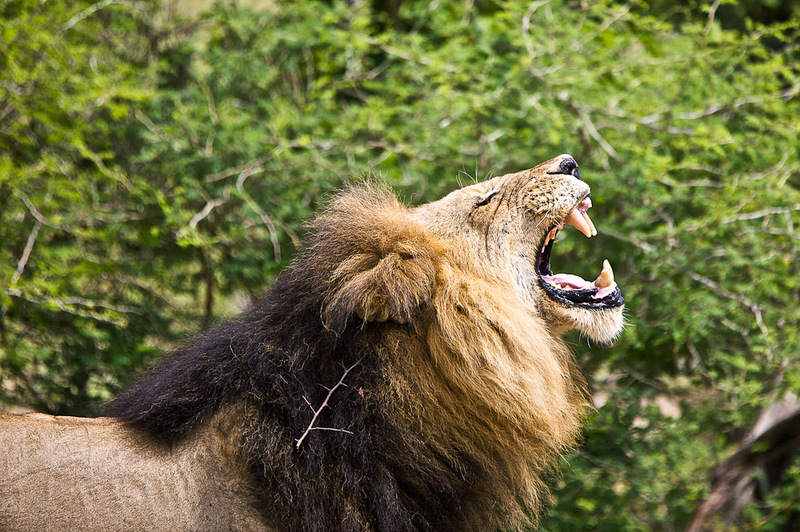 “A Kalahari lion,” he continues. 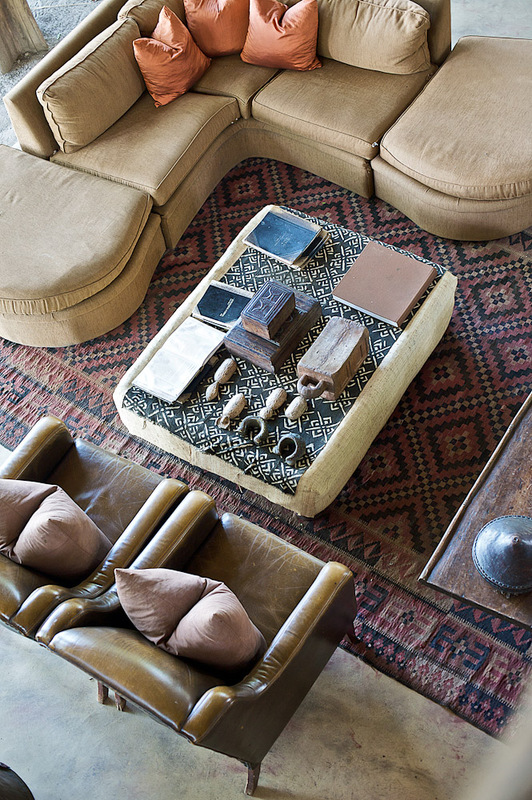 It’s enough to make even a hardened safari adventurer sit up and take note. Lions have been conspicuous by their absence in the past few months, despite the seasonal hordes of zebra populating the plains of the desert pans. “It’s a young, hungry male,” he continues. 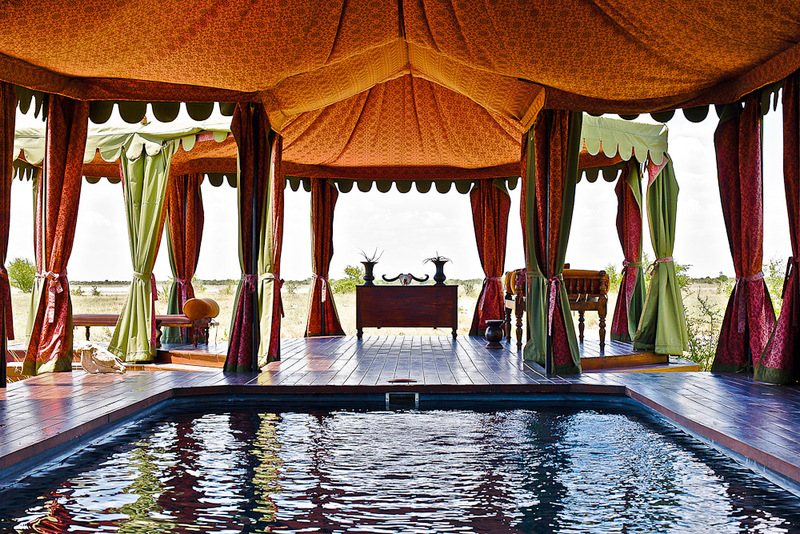 It’s my first evening at Jack’s Camp, a luxurious, desert hideaway, in the Makgadikgadi Pans, the historic remnants of a super-lake, just north of the Central Kalahari in Botswana. 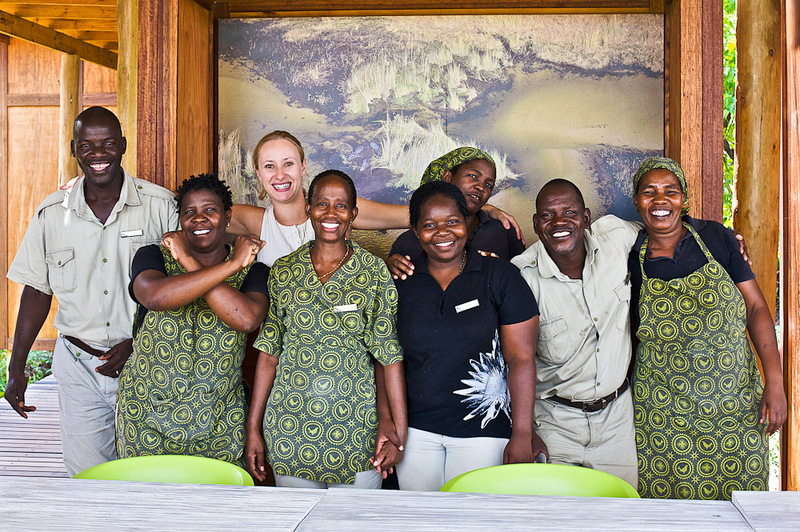 Super Sande is a safari guide who has been sharing his passion for this unique landscape for over twenty years. Just prior to his announcement, we’d been dissecting our first game drive across the aptly named ‘Serengeti of the South’ with the other guests. In the weeks preceding my arrival (early January), over 30,000 zebras had already passed the camp on their annual pilgrimage to the Okavango Delta. 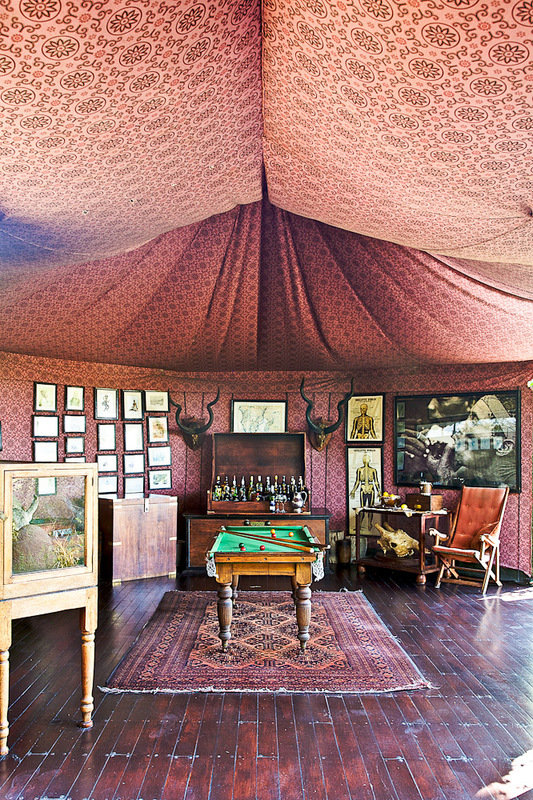 I’m still thinking about the lion as I survey the setting, the sumptuous rose-coloured interior of a slightly suspended, out-of-Africa-style tent. 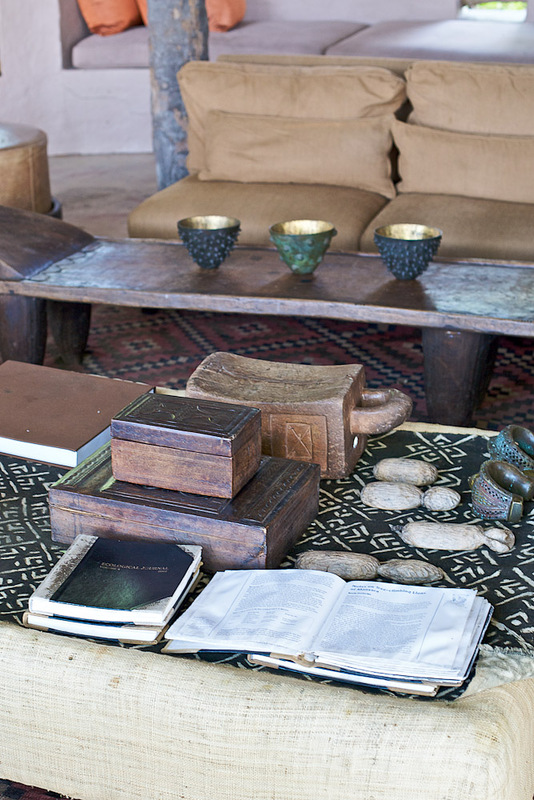 The flaps have been swept back and flickering lanterns illuminate the colonial-style furnishings, a collection of fossils, reference books and historic etchings and the grand communal dining table. 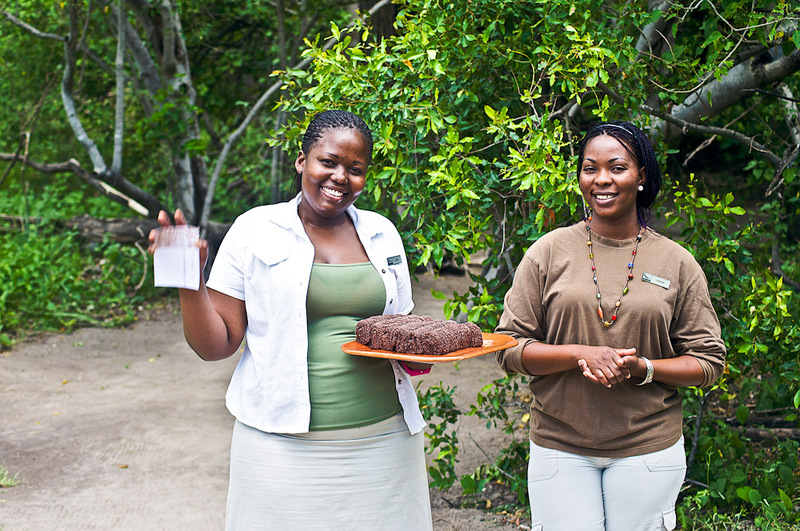 It’s a magical scene, further enhanced by three courses of mouth-watering, pan-African cuisine. But then we hear it. And it is unmistakeable. A reverberating, guttural, heart-stopping bellow. Super sprints towards his army-green safari truck. “Jump in,” he says. It’s well past midnight, but Super is dead-set on tracking the elusive lion. With a hand-held spotlight at the helm, we embark on a thrilling ride across the dusty pans, weaving and darting between the scrubland, tree groves and the odd bat-eared fox. 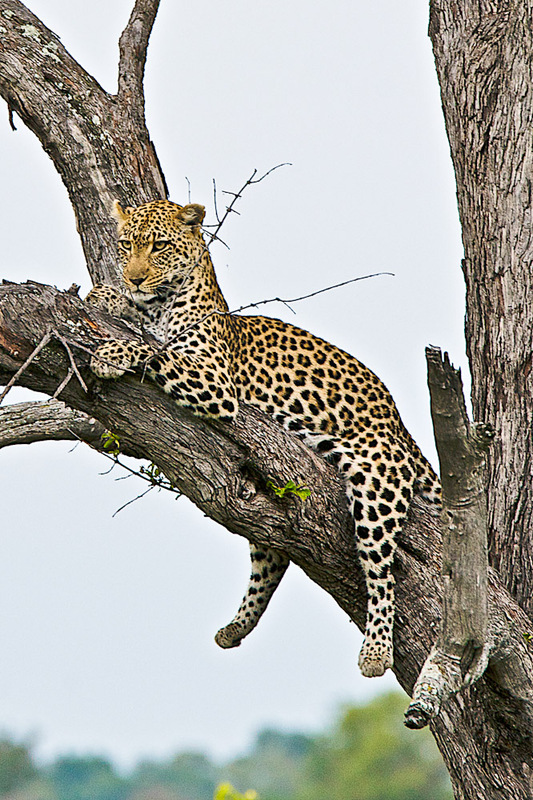 We follow a few more adrenalin-inducing roars, but our feline target remains at large. It’s a moot point, because I’m pumped. I’ve just been given an intoxicating introduction to this vast, untamed and unpredictable wilderness. 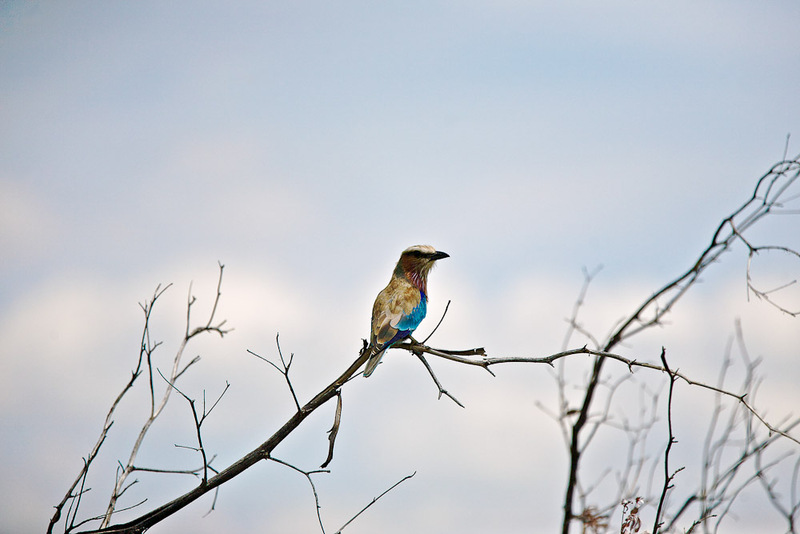 The following morning, we return to the scene with Super and Cobra, a Kalahari Bushman and legendary tracker. 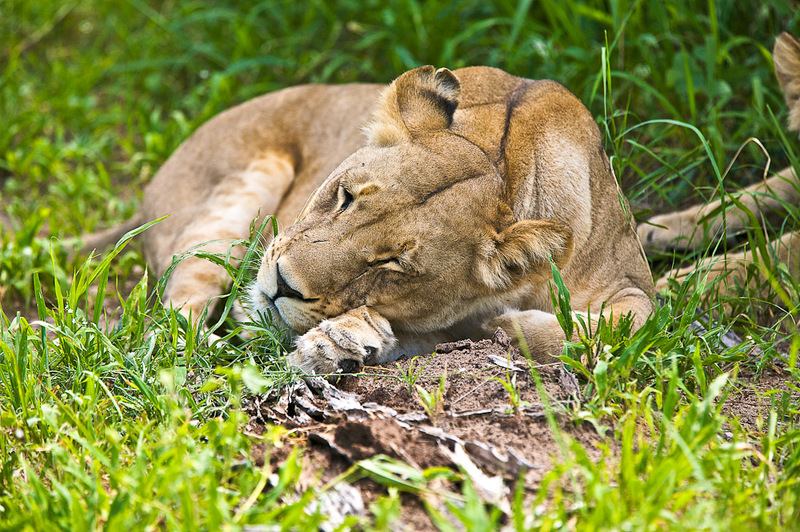 Super has located our lion’s midnight pursuit – a fresh zebra kill. The pair assess and dissect the scene like CSI experts, providing a blow-by-blow account of the dispatch. It’s a rich insight into the lion’s superior predatory skills and the duo’s acute understanding of the landscape. 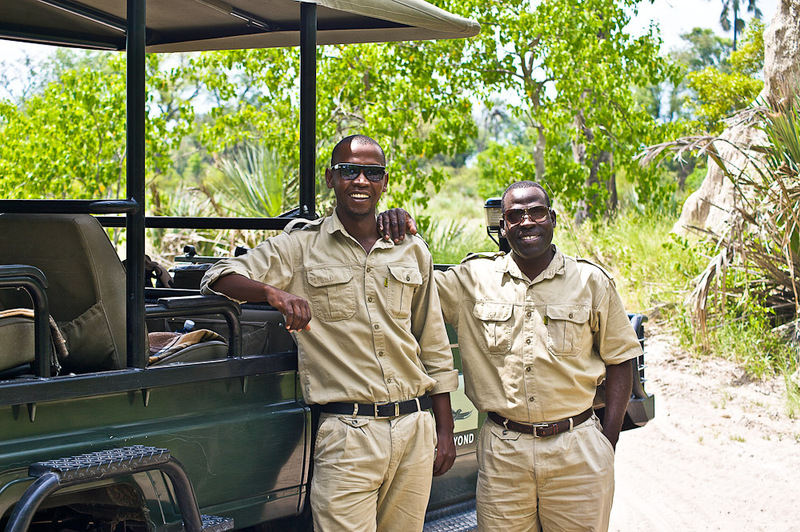 Cobra is on hand to impress us further, as the afternoon is reserved for his guided bush walk back to camp. His limited English is no impediment because his detailed demonstrations, (including foraging and fire-making), display his acute mastery of the landscape. It’s a rare honour to be in his company and I leave feeling even more connected to this remarkable terrain. 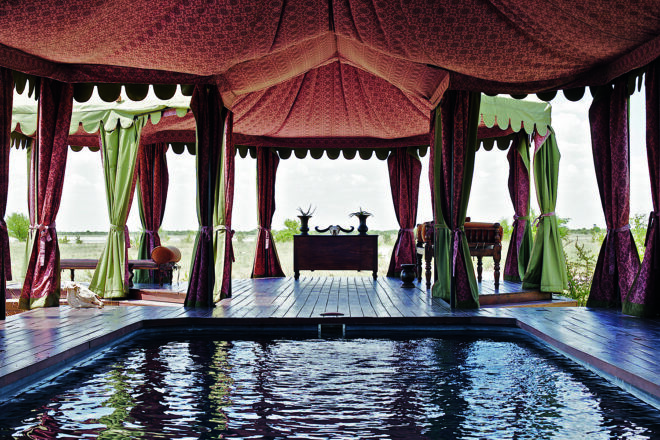 The late afternoon is reserved for a shaded respite back at camp, defined by a series of camouflaged tents set within an oasis of age-old palm trees. 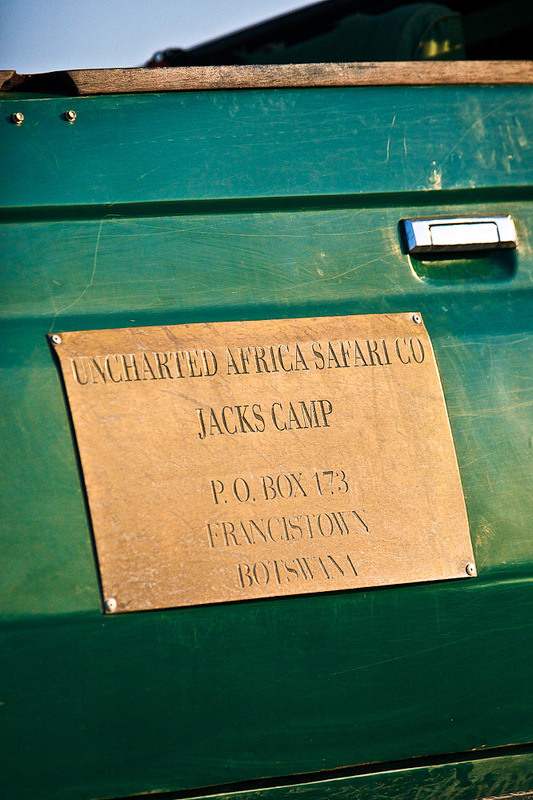 The camp was built by Ralph Bousfield in memory of his father Jack, a conservationist, crocodile hunter and passionate advocate of the region. 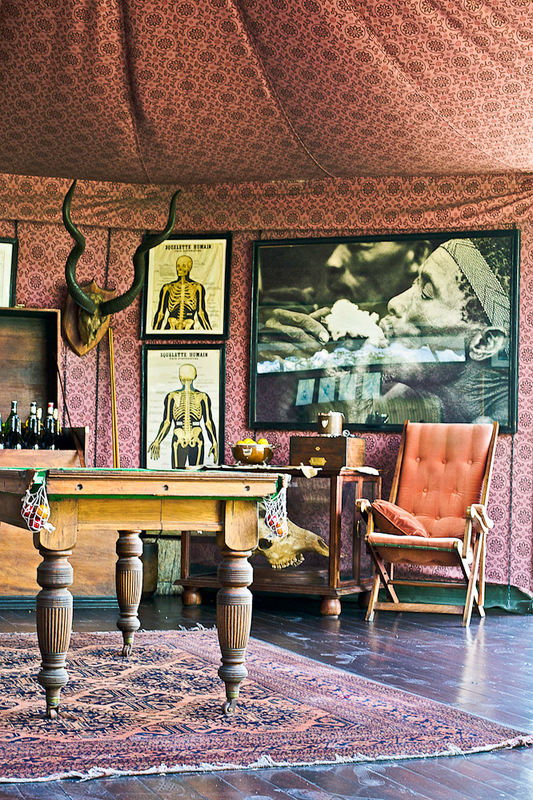 Ralph’s equally impressive credentials are evident, particularly in the camp’s collection of artefacts, which have been designated museum status by the Botswana Government. 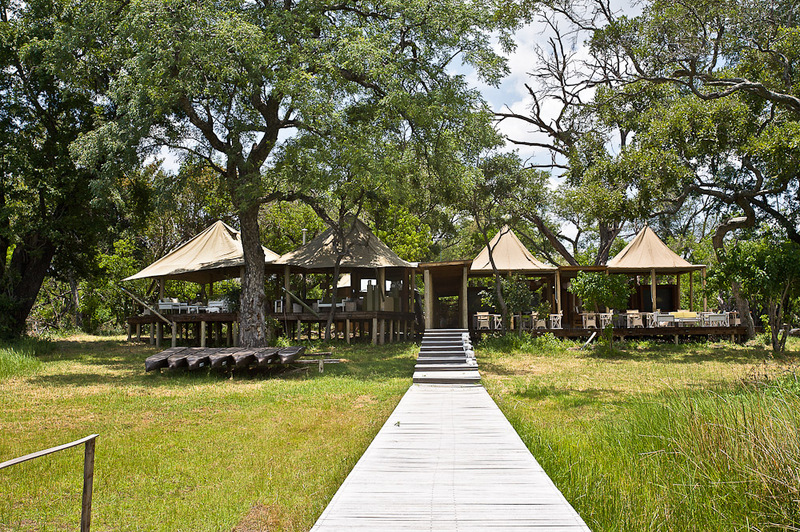 Not to be outdone, each of the suspended guest tents resemble veritable stylish, colonial-style outposts, boasting private decks, timber-panelled bathrooms, alfresco showers and canopied beds. They are also only a few hundred metres away from the camp pool, a remarkably icy sanctuary located within an open-sided tent, permanently stocked with pressed towels and home-made lemonade on silver trays. Just when I’m convinced that my adventure cannot get much better, the following morning we meet Babile, the resident “meerkat whisperer”. 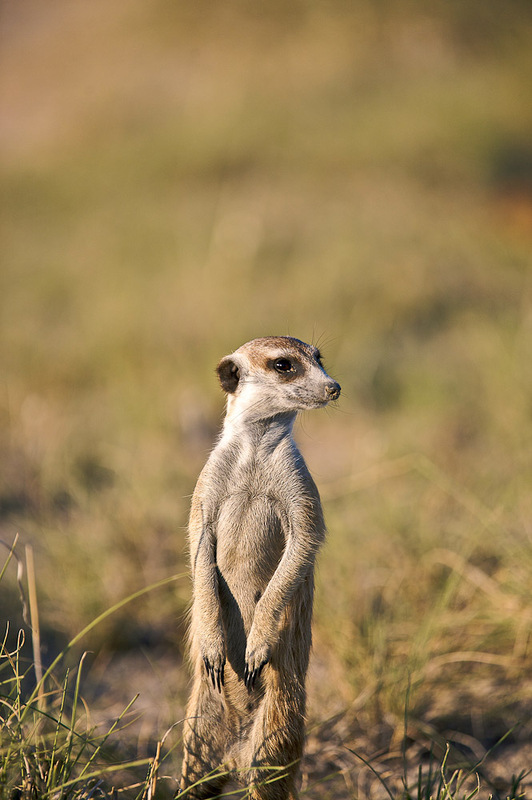 For the past seven years, Babile has been studying the habits of an extended family of meerkats and his ability to pinpoint their exact location is uncanny. As he gestures towards a series of sandy mounds in the distance, I spot their heads bob up and down rhythmically, as they burrow for scorpions. 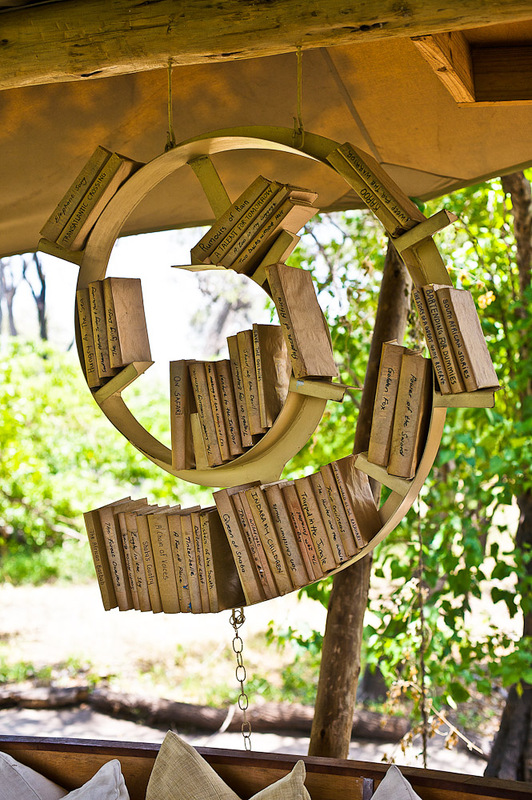 We spend a number of hours in their entertaining company before basking in the canopy of Chapman’s Tree, the third oldest Baobab in Africa and the historic ‘home’ of David Livingstone. 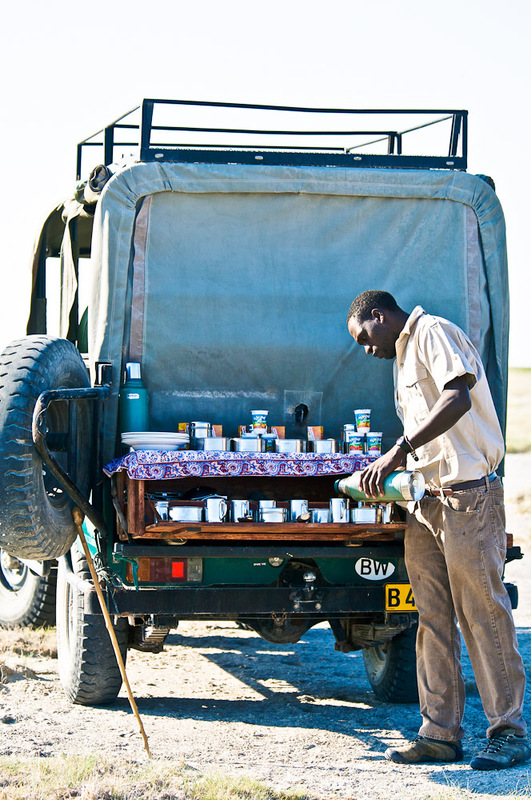 Jack Bousfield was branded an ‘idiot’ for choosing to settle in the Makgadikgadi, a region so untouched, that at first sight the terrain appears featureless. However, as any stay at Jack’s Camp will prove, the sandy sweep of desert and indelible pan basins are well and truly alive. 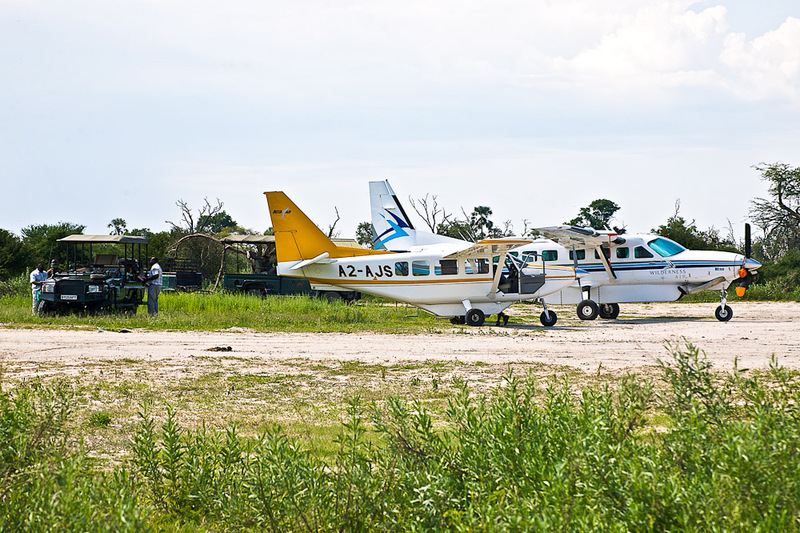 As the five-seater Cessna departs from camp, the rapid change in the landscape serves as a fitting precursor to my final destination – the illustrious Okavango Delta. 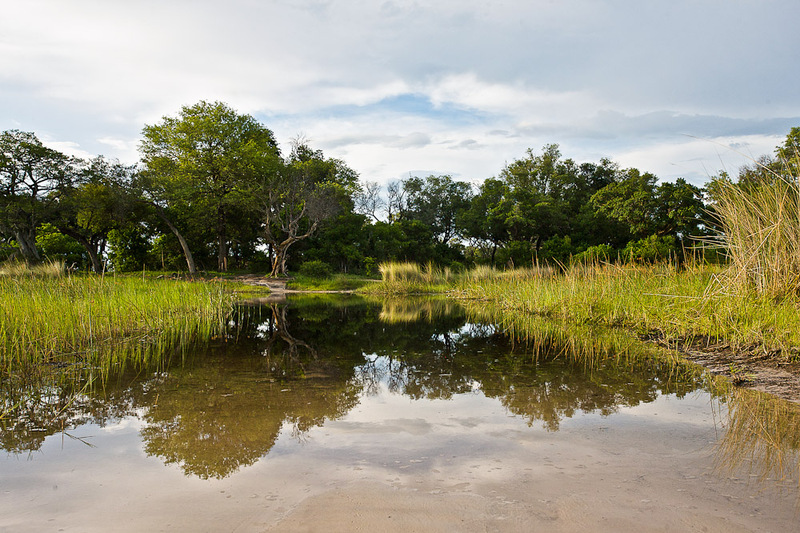 The Delta’s headwaters start in Angola where its tributaries meander southwards, taking a brief detour through Namibia before crossing into Botswana where they are filtered through the sands of the Kalahari, terminating in a labyrinth of crystal clear lagoons, lakes and channels. 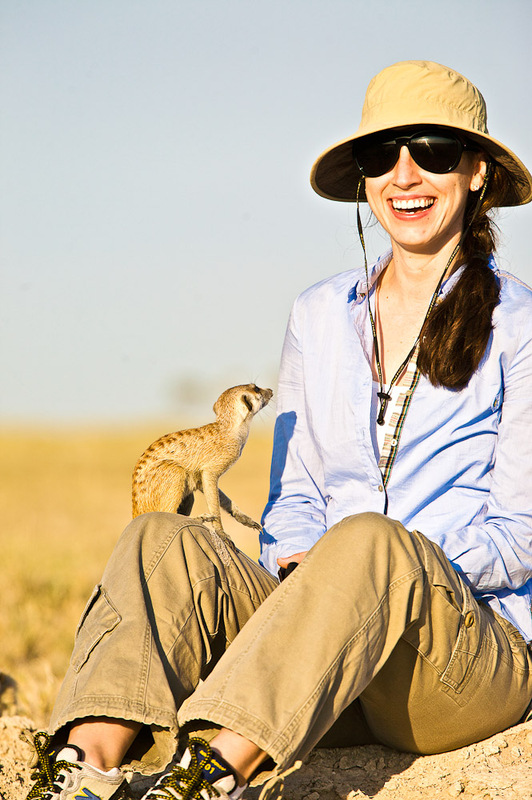 As expected, the region is home to one of the greatest concentrations of wildlife in Africa and, accordingly, some of the most prestigious safari camps in the country. I reach Sandibe by small aircraft and as if by design, I am met on the airstrip by a family of giraffe, feeding on the soft leaves of an Acacia tree. 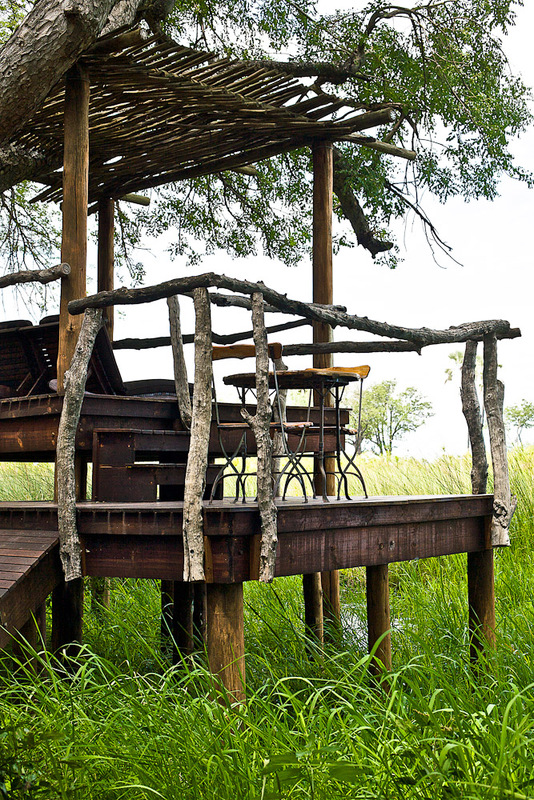 Sandibe Safari Lodge, like all &Beyond camps, is located within a private, unfenced concession, but has the added advantage of being close to the game-rich grassy plains of the Delta, on the border of the Moremi Game Reserve. The drive into camp is all the proof I need, as we encounter a herd of elephants, buck and giraffe grazing on the lush vegetation. 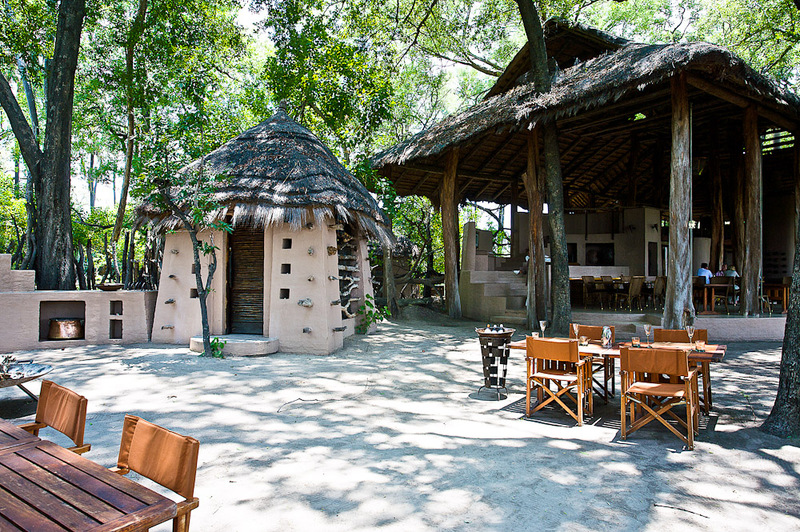 Sandibe’s appearance is rustic and earthy, characterised by a double volume, thatch-roofed lounge and dining area fronting the papyrus-lined waterway of the Santantadibe River. I am shown to my digs, a rounded, traditional chalet complete with raised timber deck, delicately hovering over the waterway. My guide suggests that on our first drive we attempt to track down a pride of lion spotted earlier in the day. As we drive across the terrain herds of Impala and Lechwe roam the grassy plains. The lion search is halted as our guides make a rare sighting. African wild dogs are notoriously feisty hunters but we catch them in a passive state, lounging by one of the watering holes. It’s a fine start to my visit. 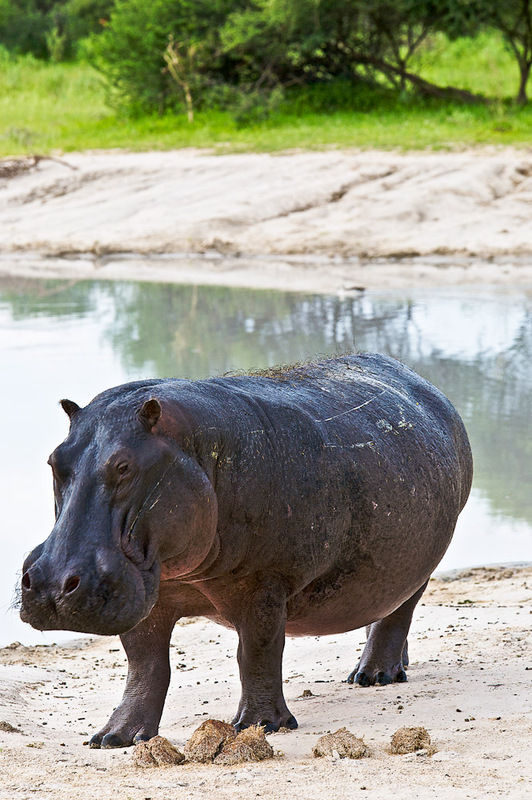 My first night in the chalet is abruptly disturbed by aggressive thrashing and thunderous guzzling, Hippopotamuses are foremost in my mind, given the countless scare stories I’d heard about their unpredictable, fatal encounters with humans. Despite the stomach flips, I opt to leave the safety horn alone. The next morning, my hippo theory is confirmed as I survey the damage. Oversized muddy, tracks and trampled vegetation cut an impressive crossing path across the front and sides of my chalet before disappearing into the river. All that’s left on my wish-list are the big cats. Notoriously difficult to locate, I mentally manage my expectations. I hadn’t factored in the extremely, skillful tracking capabilities of my two guides, who use a combination of barely noticeable spoors and seemingly bionic eyesight, to locate a lioness, basking in the full afternoon sun. Unsatisfied, they locate the remainder of the pride which includes the distinguished ‘lion king’. I become instantly obsessed with the felines. Fortunately I don’t need to wait long before my next fill, as strange jackal sounds in the distance lead us to two leopards in the undergrowth. It’s a rare double sighting. Given the mornings excitement, I’ve almost forgotten the juxtaposed Delta waters are the afternoon’s advenuture. 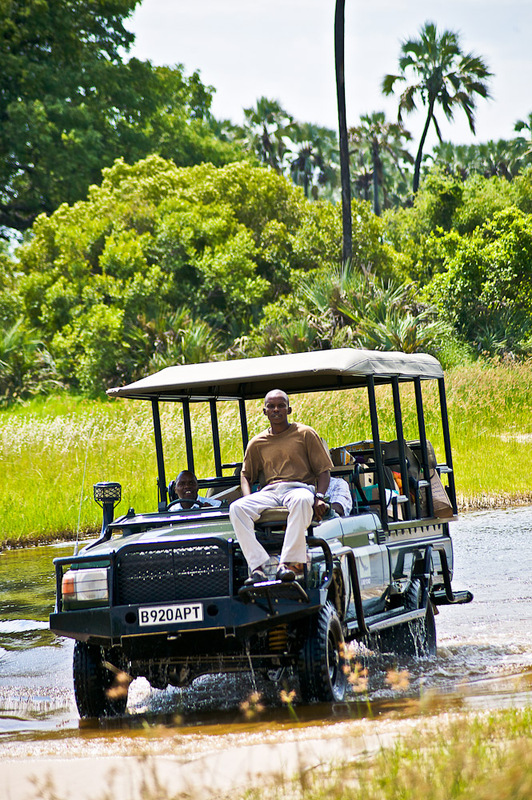 My guide expertly navigates along the channels in our power boat pointing out the ‘hippo highways’ and the fish eagles which soar and dive across the waterlily-lined waterways. 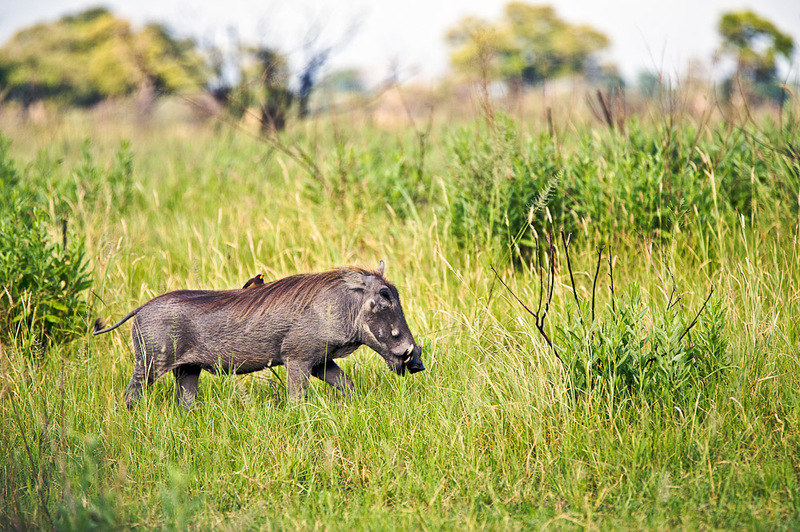 It’s a peaceful, restful journey, save for a late afternoon hippopotamus encounter. 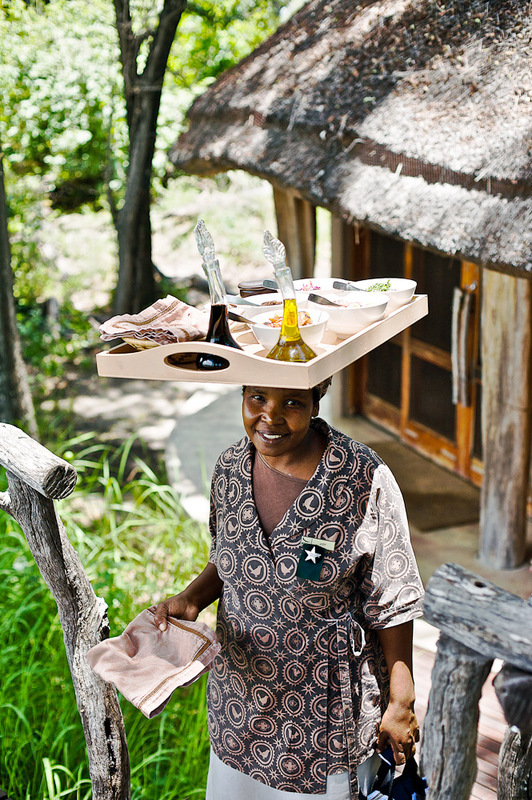 I’m told to expect many more at my final destination – &Beyond Xaranna Okavango Delta Camp. Xaranna is a watery wonderland located on the lagoons of the southern part of the Delta and a 30 minute charter flight from Sandibe. It is surrounded by a permanent river channel and a distinctive layer of papyrus, tall, reedy grass and lush, tree groves. 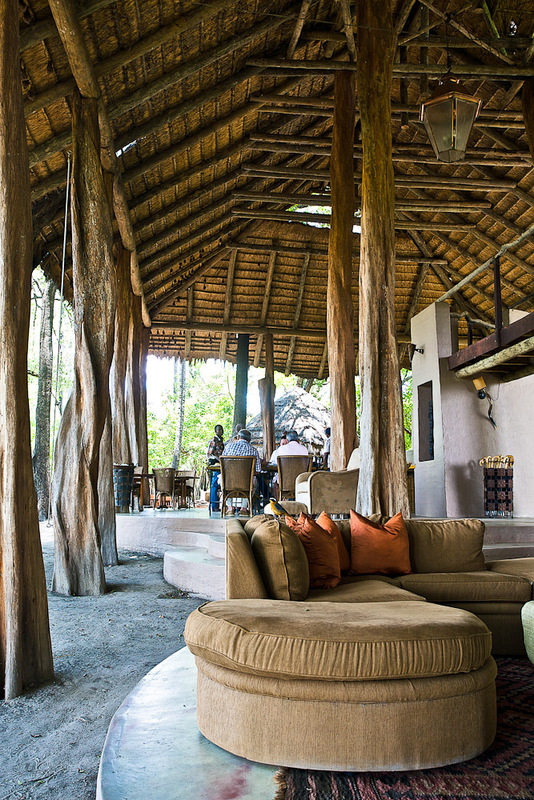 The main camp space is a suspended, tented lounge area overlooking the main lagoon and a ground-level dining area, opening onto a ‘bouma’ – a sunken, seating area oriented around a fire pit. The design is clean and contemporary, the modern white, pink and green fittings and furniture echoing the camps water-locale. Mimicking the main living area, my tent is a contemporary, pavilion-style ‘house’ with sliding doors on all sides, a private deck and plunge pool, indoor bathtub and alfresco shower. Heaven on stilts. 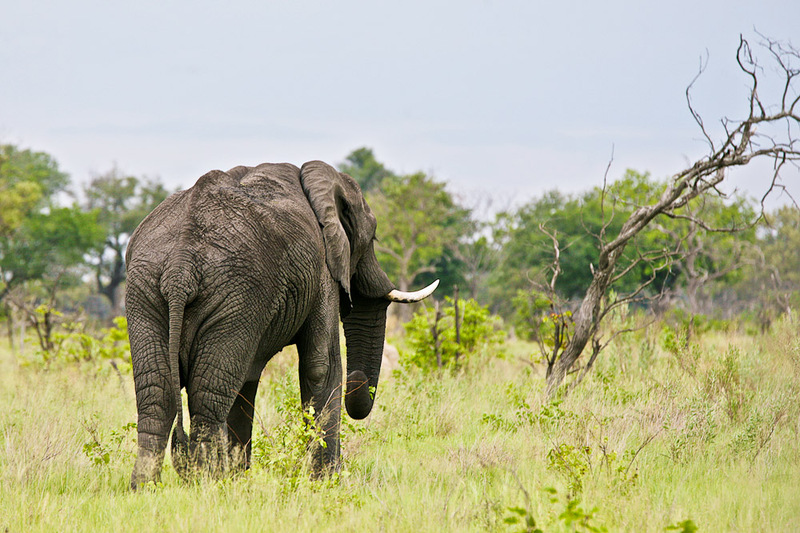 I am hoping to see more elephants. Fortunately, we spot a large, wandering pack the next morning. My guide provides insight into their human-like behaviour as we follow them slowly on their trails between the trees and vegetation. In the afternoon I opt for a mokoro (traditional dugout canoe) ride along the Delta. It’s a quieter, slower version of the boat ride, and another, heart-palpitating hippo encounter but I know that I am in good hands and my guide casually, calmly directs us around their well-protected territory. 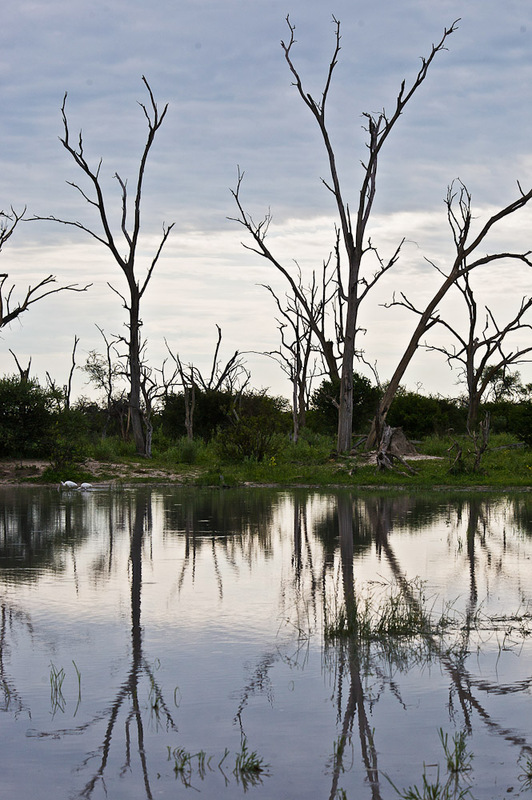 On the return flight back to Maun, I scan the landscape, spotting herds of elephant and giraffe and the remnants of carved, ancient pathways alongside the life-sustaining waterways. 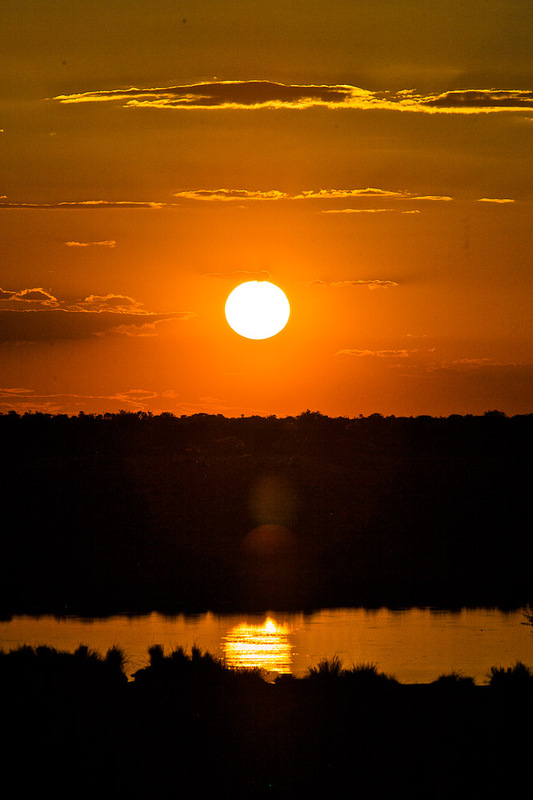 It’s a fitting aerial summary of Botswana’s dramatic natural contrasts and one of nature’s most majestic wonders. 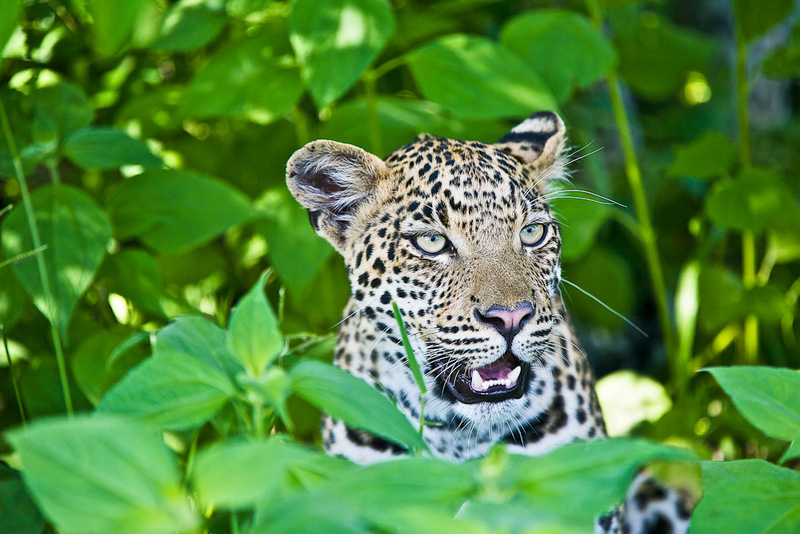 We are building a unqiue Safari lodge in Welgevonden South Africa with a amasing underground tunnel and much more. 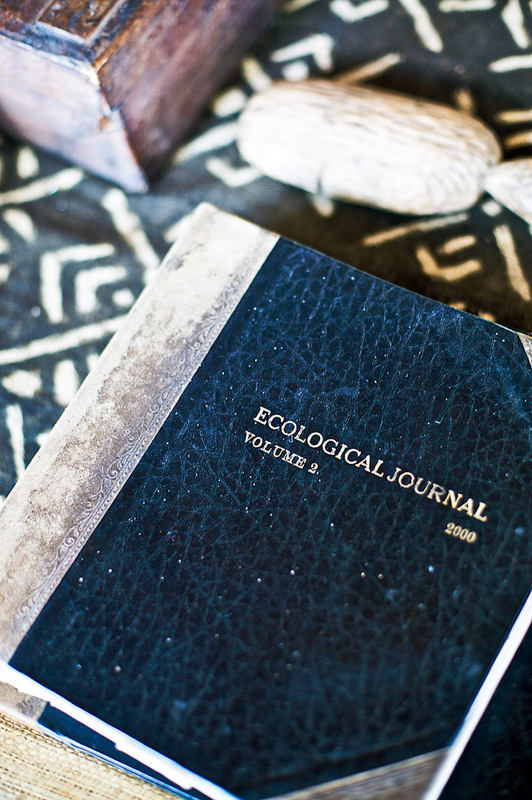 Does your magazine subscribe about these subjects? Sounds interesting! We certainly do cover new accommodation openings, both in our magazine and online.